Ahórrese los riesgos de las carreteras griegas y el costo del alquiler de automóviles en este tour completo en grupos pequeños de los monumentos religiosos de Meteora. Disfruta de la puesta de sol sobre este paisaje dramático; ver los seis monasterios y visitar el interior de uno o dos; admire la iglesia bizantina de la Asunción de la Virgen María en Kalabaka y ermitas de cuevas de 1.000 años. El tour incluye transporte y guía: las tarifas de entrada son a su cargo. Relájese con los traslados de ida y vuelta de puerta a puerta desde Kalabaka y Kastraki. 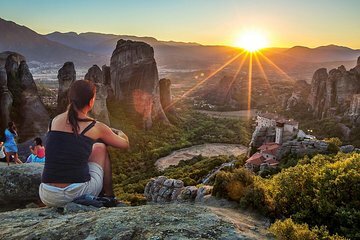 We went to Meteora in winter for a day-trip from Athens. The tour guide and mini-bus picked us up directly at Kalambaka train station. (They also dropped us off at Kalambaka station at the end of the tour in time for the train back to Athens on same day.) Tour guide Chris and driver George were both excellent. They knew all the best spots for panoramic views, very informative and friendly. We had enough time to visit inside two monasteries (Varlaam and Holy Trinity) as well as make half a dozen photo stops. Highly recommended. Beautiful sunset and intro to meteora. Might be very busy in summertime. Easy timing with nonstop train from Athens....a couple free hours to enjoy lunch. Highly recommended! Magical place and a great tour. Great guide. After booking and confirmed, no one called me or emailed me anything to confirm the tour. Ended up me calling them and found out that the pickup time is different from what's written in the voucher it is actually 3.30pm instead of 4.30pm. The pickup was relatively on time, just a few minutes late. Chris was really friendly and enthusiastic but his English tends to become non-understandable at times when he starts to get too enthusiastic and his speech can go on for quite long holding up everyone in the bus. The driversorry i forgot the name was really helpful and nice too. Good that the driver really knows where to bring us for the best photo spots. Overall a value for money tour. This is an excellent tour. Vasilis, our tour guide was great. I highly recommend this tour. My only advise is to visit as many monasteries as you can at your own, because you only going to have the chance to see the inside of St. Stephen's monastery during the tour. Wonderful tour, excellent service, highly recommended! I am the only visitor that day! They still conducted the tour, very trustworthy. Rich knowledge about the history in the area, the 4 hours are full of fun. Not only visted monasteries and historical sites before the monasteries, but also showed me the top spots to take great photos - even help take photo of me. It made my day in Meteora. Chris ? our guide was excellent. He was friendly, attentive, entertaining and made up for the fact that we happened to get rainy day, which is unusual in Sept. We really enjoyed our tour and saw many things we would not have seen with our our guide. It also served as a good introduction to Meteora and the area.